PV swimmers ride the crest of the wave as they swim to victory. 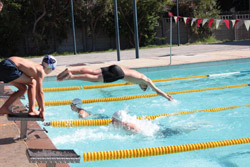 When Ms Marelise Kuhn, the present swimming organizer, took over as coach several years ago, Parel Vallei’s swimming team was on the rise after years of being the “underfish” at the annual inter-schools galas against Hottentots Holland High School. Until then, every year at the galas held at the Olympic-sized pool at the Strand Pavilion, it had been a losing battle for the trophy. (Hoërskool Strand briefly entered the fray at a later stage). After training doggedly – initially at the Pavilion but later at Beaumont, PV soon overwhelmed their competitors and Parel Vallei sought stronger rivals at twilight galas against Somerset House while still training assiduously at Beaumont. Some of the top swimmers from Parel Vallei are the likes of Lucy Saunders who achieved Springbok colours in life-saving and Ashley Oliver who was selected twice to the SA Junior team which participated in Brazil and won a bronze medal at the Senior SAs. Christine Zwiegers achieved gold at the Level 3 meeting and a silver medal at the SA Senior championships. Yolandi van der Merwe was chosen as the senior WP captain for the SA championships and represented SA at the Open Water swimming championships in France. Christine Zwiegers, Yolandi van der Merwe and Shannon van Konynenburg also received bursaries to study at overseas universities on the strength of their excellent swimming achievements. John van Zyl, Nic de Vos and Arlin Lincoln respectively achieved the top 3 places at the Level 3 National championships in their age-groups. PV won the Boland Schools Twilight trophy for Co-ed schools in 2015. PV also won 5 out of 6 Helderberg triangular meetings against Somerset College and Hottentots-Holland. 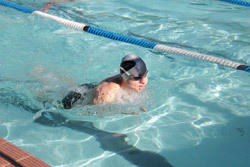 The swimming season starts annually with the Grade 8 gala which is enthusiastically organized by the Learner Council. The Grade 8s make a big splash and soon forge firm bonds as they participate en masse, showing that team-building and spirit are two of the core elements of PV’s BLUE THREAD! 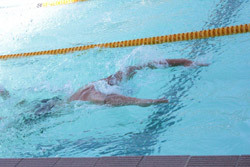 Other competitions in which we participate include relay galas in the Boland League and one or two in the WP League. These galas are great fun and full of spirit. Social swimming was introduced where style correction is the main focus. Then there is our participation in the Cape Swim Mile in which PV won the prize in 2015 for the school with the greatest participation. In 2018 PV won 2nd place at the Frank Myburgh Twilight Gala. With achievements like these, we eagerly look forward to having our own pool for swimming training and water-polo, so take the plunge and contact Ms Marelise Kuhn.